“FLYING OZ,” THE OZARKS AIR TRAIL! Rugged beauty, stunning vistas, secluded cabins and B&Bs, unique lodging options, cute towns, camping, sparkling rivers to canoe or kayak, lakes for different water activities, waterfalls, fish-filled lakes and rivers, hiking and biking trails, off-roading trails, horseback riding trails, zip-lining, fly boarding, golfing, museums, awe-inspiring caverns, shopping, interesting history… the Ozarks offer enjoyable and fun year-round adventures and activities and available to pilots with average to above average skills. Figure 1. Byrd’s Backcountry Airstrip. The Ozarks provide a stunning backdrop for a long vacation or some weekend getaway fun – your choice! We have developed a route that includes activities and airports for pilots and travelers of all ages and interests. We have chosen nine different stops with two of the stops having multiple airports to choose from. We have included a mixture of community and backcountry airstrips, paved and non-paved runways, public and private airports… to ensure there is something for everybody based on pilot skills and experience and aircraft capabilities. Keep in mind some of the private airstrips may require prior permission from the owners. Fly at your own risk – you are Pilot in Command! Figure 4. First Half of the Route (see references to locations in Figure 6). Figure 5. Second Half of the Route (see references to locations in Figure 6). Figure 6. References to Locations on Previous Sectionals. 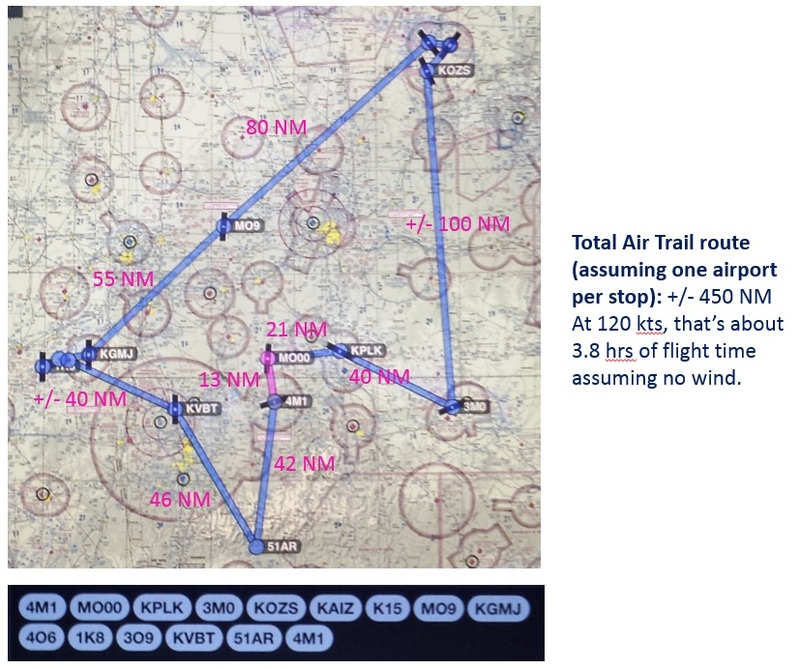 Or, for easier reference, you can view the route in a screenshot of ForeFlight. ​Figure 7. Route on ForeFlight. 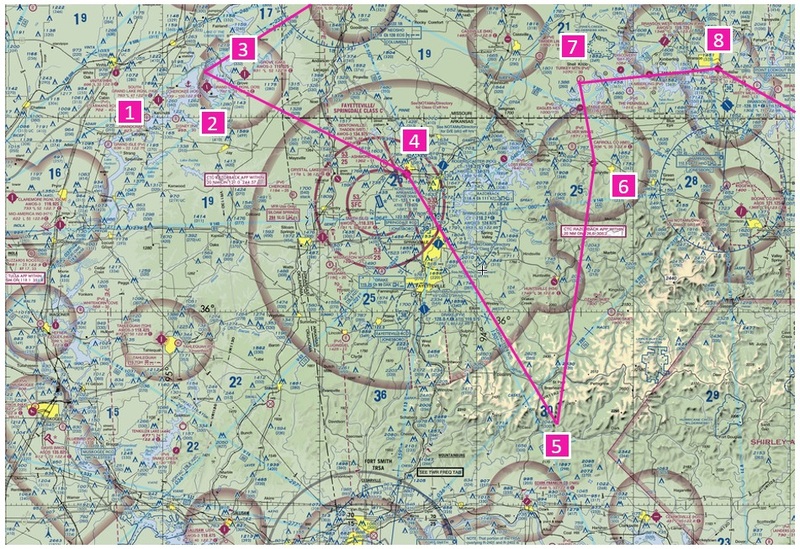 You can start/stop this route from any airport and fly it in any order or direction you prefer. Keep in mind some of these do not offer fuel. Please plan accordingly! You may also want to pack a set of tie downs for your aircraft. If you decide to do part or the entire route and use social media, we would love for you to use #OzarksAirTrail as a hashtag. Fly safe, fly often! Enjoy the Air Trail! South Grand Lake Regional (1K8) in Ketchum: The nearby Pine Lodge Resortprovides a free shuttle to/from the airport. 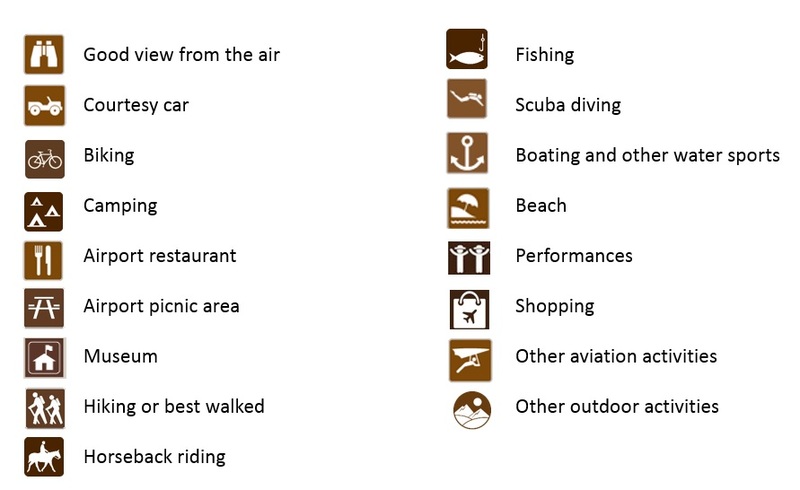 The airport’s website has a list of things you can do once there in addition to other information, such as rental car or additional lodge options. This AOPA article titled “Airports and Oklahomans: The perfect match” provides a June 2015 update on what’s happening at this airport. Since then, more hangars have been built. Grand Lake Regional (3O9) in Monkey Island: The Landings on Monkey Island community, as they call it, offers direct home access by land, water or air. This airport has not one, but two, on-site restaurants. Market and Grill is in the FBO alongside a convenience store, a gas station and a car wash. Aqua Bar & Grill is down in their marina, on the water. There, you can also rent a boat or jetski. Sangri La Resort offers championship golf and it’s only a mile away. Grove Municipal Airport (KGMJ) in Grove: KGMJ has a modern terminal building that just opened in April of 2016. Grand Lake and the Neosho River are great places for you to obtain a seaplane rating or exercise it, if you already have one. Steve Robinson with Grand Seaplanes, LLCwould be happy to offer some training in his Lake Amphibian. He normally operates between his house on the lake (where he ramps his aircraft), 1K8, and KGMJ. Nearby Disney, OK is known among 4-wheelers. There is world class off-roading and “jeeping” below the Pensacola Dam. Hogan’s Off Road Park, as an example, is a campground that offers 25 miles of woods trails, a rock crawling area, as well as some deep mud pits and swimming holes. The Grand Lake State Park has several smaller parks that are located near the Pensacola Dam and around the lake. Looking for other things to do and see once there? Visithttp://www.travelok.com/grove for plenty of options. 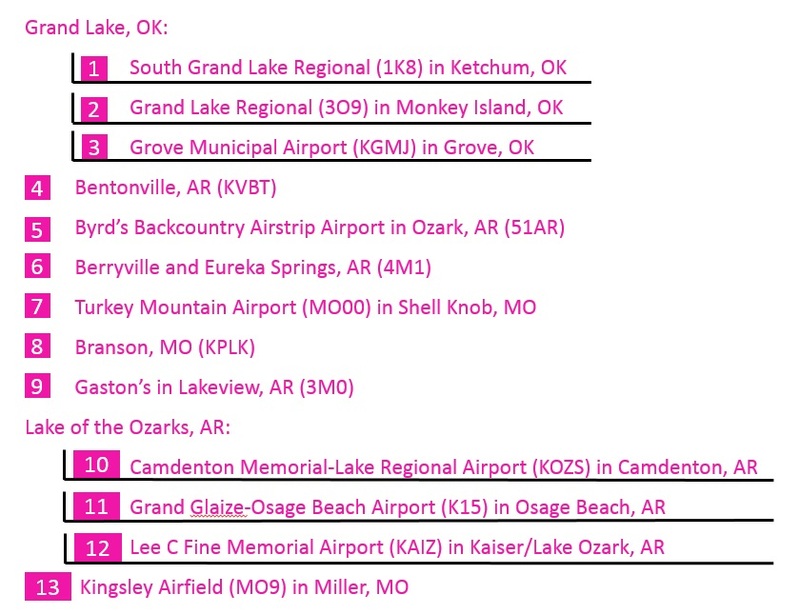 Northwest Arkansas has quite a variety of airports to choose from but Bentonville Municipal Airport/Louise M Thaden Field (KVBT) really stands out as a friendly GA airport that is trying its best to offer everything any pilot could ask for. The City of Bentonville offers a courtesy car and the FBO, Summit Aviation, can offer you a bike to ride, shuttle you, or line up a car. Summit also offers backcountry flying and tailwheel training and instruction! KVBT has an “outdoor pilots lounge” on the Northeast corner of the airport, just south of Lake Bentonville. Relaxing, fishing and picnicking are encouraged. Camping is also an option. Figure 3. “Outdoor Pilots Lounge” at KVBT. Enjoy world class mountain biking at the Slaughter Pen Trails. Bike rentals are available at Phat Tire Bike Shop. Ride a portion of or the entire 36 miles of paved trails the Razorback Greenwayproject has to offer. The closest entry point is only 1.7 miles away, due east from the airport. See the Sam Walton Museum in the town’s square. You may know Sam Walton as the founder of Walmart but he was also a pilot, starting with an Ercoupe he used as a business tool that has brought success to his company. Tour the world class Crystal Bridges Museum of American Art showcasing American art in a beautiful, wooden setting. ​Since 1982, Byrd’s Adventure Center at Byrd’s Backcountry Airstrip Airport (51AR)has been “the leading off-road and ATV park in Arkansas and one of the top canoe, kayak and raft rental services on the wild and scenic Mulberry River, surrounded by the Ozark National Forest.” It’s a great place to fish, hike, or just simply relax! But, that’s not all. Byrd’s Adventure Center features two grass runways on 800 private acres. 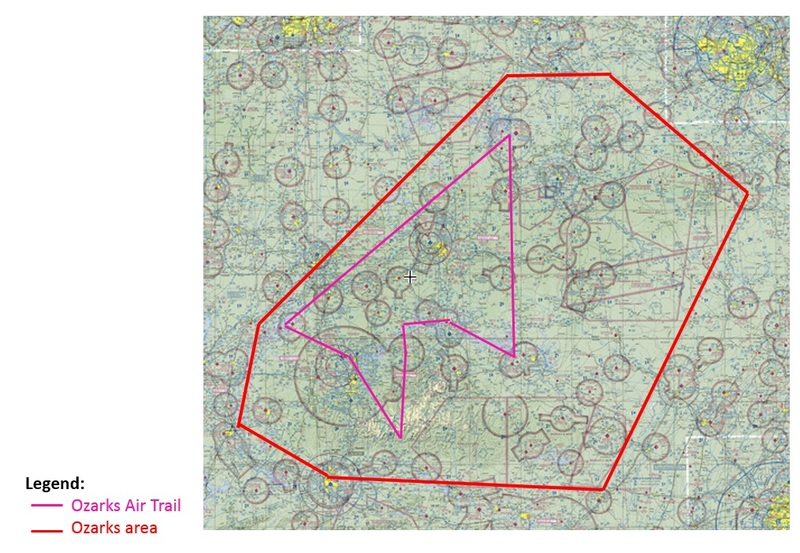 The primary 1,900’ 07/25 runway is suitable for many single-engine airplanes. Landing to the west and departing to the east (conditions permitting) is recommended and pilots are encouraged to monitor 122.8. All pilots and aircraft are welcome; however, the Center does recommend some mountain flying experience (see above, under KVBT) as gusty conditions can create turbulence along the runway. The secondary runway, 1,200’ 17/35, accommodates short field oriented aircraft and pilots. With an electric line at the south end and a line of trees and a sharp elevation increase on the north end, creative approaches and departures are required. ​If you are the camping type, bring your gear! Primitive camping is offered with access to a large heated shower house. If you’re not… no problem! Cabins are available as well. The Center also has a year-round store and a riverfront restaurant normally open, Friday, Sat & Sunday, from March to December. Byrd’s hosts fly-ins every spring and fall so you may want to time your trip with one of their fly-ins. If you plan ahead and give them a call, they may also be able to arrange letting you use a courtesy car during your stay. In 1930, the City of Eureka Springs purchased land for a landing strip. This is now theCarroll County Airport (4M1). Another airport, the Lake Lucerne Airport, was also built in 1930 but, unfortunately, it closed about 30 years later for housing. To learn more about Eureka Spring’s aviation history, visit http://blog.aopa.org/vfr/?p=835. It’s only a 9 mile drive between 4M1 and Eureka Springs via a scenic but winding road (highway 62) that takes about 15-20 minutes to drive. In fact, they say that the roads to Eureka Springs are some of the best touring roads in the U.S. The airport has a half a dozen courtesy cars available for pilots and crews to use. The historic town has plenty of cute shops, galleries, spas, restaurants, etc to explore. Looking for more things to do and see once there? Visit http://www.eurekasprings.org/ and http://www.eurekaspringsonline.com/ for some more suggestions. Looking for unique lodging options? Try a safari lodge or a tree house at theTurpentine Creek Wildlife Refuge or maybe a castle, cave or hobbit at Estree Houses. Hungry? The restaurant at the Turkey Mountain Airport (MO00) is a good place to stop in. They usually have a fly-in every month also. Note this grass strip is a private own, private use airport so you will need prior permission from the owner to fly in. FMI and to find the owner’s contact info, visit:http://www.turkeymountainairport.com/. While Branson has several different airports to choose from, M. Graham Clark Downtown Airport (KPLK) is the closest airport to town. It is also the airport a Southwest Airlines B737 crew confused for the Branson Airport (KBBG) back in 2014. Branson’s 76 Country Boulevard is famously lined with theaters, which once hosted mostly country music performers but today present diverse entertainment. Also along the strip are Silver Dollar City, an 1800s-themed amusement park with live music, the landmark Marvel Cave, Dolly Parton’s Wild West-style Dixie Stampede dinner theater, and numerous shopping opportunities at area malls. New attractions in 2016 include the Branson Ferris Wheel and Fritz’s Adventure. So, Branson is a good place to eat, visit a museum, enjoy an attraction, or take in a show: magic, rock ‘n’ roll, country, family harmonies, comedy, dinner shows, gospel… You name it, they have it! Prefer to stay away from the hustle and bustle of town? You can also golf, hike, horseback ride, zip-line, or enjoy the many water activities at one of their three beautiful lakes: Table Rock Lake, Bull Shoals Lake, or Lake Taneycomo. Table Rock Lake is a world-class spot for boating, fishing and swimming. Table Rock State Park features a modern campground, a full-service marina, trails, picnic areas, etc. The State Park Marina is a great place for lake activities, anything boating to scuba diving. Want to try a different type of flying activity? You may want to try para-sailingor the newer fly boarding. Just want to enjoy the lake and relax? Sure! You can even rent a houseboat. Lake Taneycomo has clear cold waters which provide some of the finest trout fishing available anywhere in the world! The Missouri Division of Tourism’s website has a good website with more ideas. The airstrip (3M0) has a 06/24 runway with their own Bermuda grass and is open to everyone. They encourage everybody to use 122.8. Their restaurant is normally open from around Valentine’s Day to Thanksgiving weekend. You can try some of the freshest trout or go for a steak. You can camp, if you want, but “enjoying the great outdoors at Gaston’s is by no means, roughing it.” They offer cottages and a lodge. If you have never fly fished before or if you would like to improve your skills, they also offer classes with one of the most knowledgeable fly fishing guides on the White River. ​The Bull Shoals-White River State Park is just 7 minutes away by car. The visitor/education center is named in honor of James (Jim) A. Gaston, owner of Gaston’s White River Resort. Its observation tower affords a sweeping view of the White River, Bull Shoals Dam, and Bull Shoals Lake. Interpretive exhibits are featured throughout the lobby, theater, gift ship and exhibit hall. ​Lake of the Ozarks is the No. 1 recreational lake, according to USA Today. Camdenton Memorial-Lake Regional Airport (KOZS) in Camdenton: This may be the closest airport to Ha Ha Tonka State Park and Bridal Cave. Lee C. Fine Memorial Airport (KAIZ) in Kaiser/Lake Ozark: This airport is actually on Lake of the Ozarks State Park property with many hiking trails, horseback riding, and other recreation areas. There might be a cave right under the approach of the airport also and a dedicated observation area allows people to view aircraft coming and going. Grand Glaize-Osage Beach Airport (K15) in Osage Beach: This may be the closest airport to the most popular town on the lake – Osage Beach. Lake of the Ozarks State Park, the largest in the state park system, contains natural areas ranging from rugged, wooded areas to delicate cave formations and more than 80 miles of lake frontage. In addition to hiking and backpacking trails, the park has three equestrian trails (guided rides are available from Hayburner Ranch) and two mountain biking trails. An aquatic self-guiding trail marked with buoys on the Grand Glaize Arm of the lake is designed for boaters interested in learning about features along the shoreline. On the south end of the park is Ozark Caverns, best known for a deposit called “Angel’s Shower,” a never ending shower of water that seems to come out of solid rock. With lantern in hand, visitors can view sleeping bats, bear claw marks and the speleological wonders as the first explorers did. 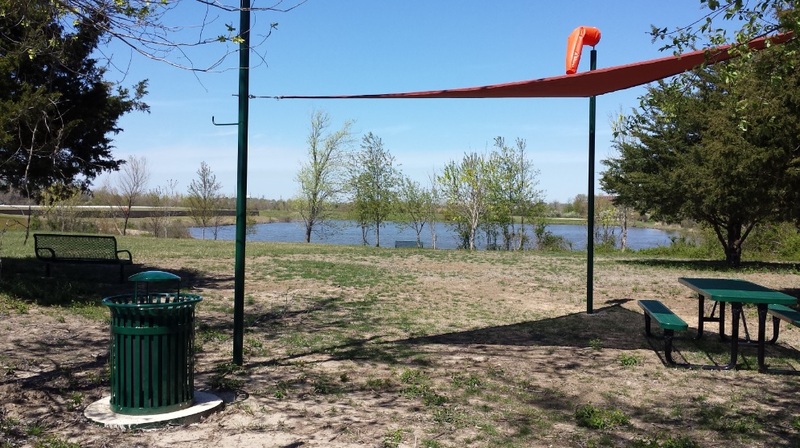 ​As a water-based park, the park also offers excellent opportunities for water recreation. Two free public swimming beaches include bathhouses and shady picnic areas nearby. Public Beach #1 also offers canoe, kayak and paddle boat rentals. ​Camping facilities, ranging from primitive to electric hookups, are available year-round and include modern restrooms, laundry facilities and dumping stations. If you have never been in a helicopter, the Lake of the Ozarks may be a good place to do it. Lake Ozarks Helicopters, Inc. offers six different routes around the lake during the warmer months of the year. For more things to see or do while there, visit http://www.funlake.com/ andhttps://www.visitmo.com/lake-of-the-ozarks.aspx. ​Hungry? The Hangar Kafe at the Kingsley Airfield (MO9) is a great place to have a hamburger. MO9 is a flat grass strip right in between the Grand Lake Area and Lake of the Ozarks. They also have live music most Friday and Saturday nights during the summer months. FMI: https://www.facebook.com/Hangar-Kafe-172233816266197/. Like the thrill of skydiving? The Ozarks Skydive Center is based at MO9. You can explore Petit Jean (KMPJ), Plane Crazy USA at River Bend Aero Ranch just east of Mena, or Hot Springs (KHOT) in Central/Southern Arkansas on your way to/from the Ozarks. There are more than 20 miles of hiking trails in Arkansas that will lead you through Petit Jean’s natural and historic resources. Walk to the spectacular 95 foot Cedar Falls, one of the most spectacular waterfalls in Arkansas, meander through ancient geology on the Seven Hollows Trail, or enter Rock House Cave and view ancient pictographs. The Petit Jean State Park Airport (KMPJ) has five tent sites with electricity and water. But, if camping is “not your thing,” the Mather Lodge is a great place to stay with 24 guest rooms and several cabins. The lodge also has a restaurant. Located in Polk County, just nine miles east of Mena, this private airstrip provides a 3,300 ft. North/South grass landing strip in the Ouachita Mountains and on the banks of the Ouachita River, making it a very scenic and unique field from which to fly. Spend a night or a week. They have hookups for RVs, plenty of space for tent camping, and a three bedroom and two bath cottage. You can canoe, kayak or fish on the Ouachita River (they can provide a canoe and shuttle service), hike or bike on several trails, horseback ride on trails in the National Forest, visit the nearby Wolf Pen Gap ATV trails, take a drive on the Talimena Scenic Drive, visit the Queen Wilhelmina State Park, or stroll through Mean’s downtown and many shops. Restaurants are available in downtown Mena or just a mile down the road at the Cherry Hill Store. Note this grass strip is a private own, private use airport so you will need prior permission from the owner to fly in. FMI and to find the owner’s contact info, visit:http://www.planecrazyusa.com/. The Memorial Field Airport (KHOT) is the town’s airport and has a courtesy car for quick errands. You can access the Hot Springs National Park from the middle of town. Hiking, picnicking, camping, and taking a bath in one of the bathhouses on Bathhouse Row is all available. The Oaklawn has well-known horse races from January to April every year but they also offer Vegas-style games all year around. You can get awesome views of the area from your aircraft; however, you can also go up to the 216-foot high Hot Springs Mountain Tower for a different perspective. Hotels, resorts, bed & breakfasts, camping, cabins, houseboats… there are all kinds of lodging options. For more information, visit http://www.hotsprings.org/. In addition, the AOPA Central Southwest Regional Page covering NM, TX, LA, OK, AR, KS, MO, NE and IA has a blog on “friendly airports and helipads” with a list of those that have an on-site restaurant, an aviation museum, an aircraft viewing area, allow camping, etc that you may consider stopping at. Looking for other fly-in destinations, air trails, air tours, or flyways in the region? Take a look at AOPA’s Central Southwest Destinations page. ​In addition, the “Arkansas Wild” magazine published an article titled “Explore Ozark Backcountry Aviation” in their Fall 2015 edition, (pages 30 – 40). ​Not sure how exactly you are going to get around once on the ground at some of these locations? Looking for ways to bring a bike or canoe with you? Ask the specific airport and take a look at this blog I recently published for some more ideas.